The name of the country should be changed from ‘Democratic Socialist Republic of Sri Lanka’ to either the ‘Republic of Sri Lanka’ or just ‘Sri Lanka’ says Tamil National Alliance (TNA) MP M. A. Sumanthiran. 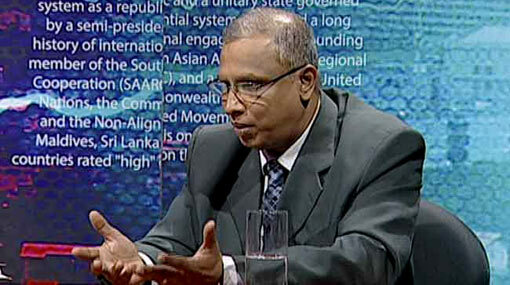 He mentioned this joining the TV Derana ‘Wada Pitiya’ political program, last night (22). He states that although they agree to act as a unitary state, they do not agree to label the country a ‘Unitary State’. He says his party interprets the phrase ‘Unitary State’ as ‘one country’. According to him, they have fought for a separate state for 30 years and now they have arrived at a middle ground. Sumanthiran states that if they are unable to pass the points they expect from this constitution, there is a risk of a more extremist party being appointed by the Tamil community at the next election. Responding to this statement at the program, PHU Leader MP Udaya Gammanpila said that Sumanthiran statement was similar to a threat by a gun; however, only words were used here.